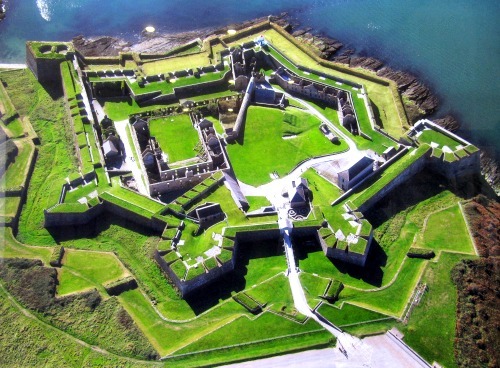 Charles fort was built between 1677 and 1682 on the site an the earlier stronghold which played an important military role in the area. Designed by Sir William Robinson, an architect of the Royal hospital Kilmainham the fort was built in the star design which was specifically designed to withstand cannon fire. In 1690 during the Williamite war in Ireland the 1st Duke of Marlborough, John Churchill besieged the fort destroying a large portion of its walls, but due to the forts design and elevated central position the siege was unsuccessful. After the siege repairs were made and then for the next 200 years the fort was used as a British army barracks for the area. As part of the conditions of the Anglo-Irish treaty of 1921 British forces gave up the fort but it was burned by retreating groups who were opposed to the treaty during the Irish civil war of 1922. Since the it has fallen out of use but was named a National monument of Ireland in 1971 and has also been partially restored by the Irish heritage service. Today the fort is open as tourist attraction and is an impressive monument to see. Please check with the place directly to check any seasonal opening times. Places such as forts have seen their fare share of violence and death, creating the basis for ghosts, but the tale of Charles fort's hauntings does not come from its siege or destruction, but of a tragic love story. The fort is believed to be haunted a spirit which the locals have named "The white lady", and her story goes as follows. She was the daughter of the commander of the fort and led a fairly uneventful and privileged life in the local towns. One day a handsome young officer was sent to the fort to be stationed there and met the commanders daughter. Falling in love straight away the two were quickly married and had a wonderful ceremony with her fathers blessing. On their wedding night at the fort the couple took some time for a moonlit walk and strolled hand in hand along the ramparts. Reaching the east side of the fort the bride saw a beautiful white rose growing near a bush below the high walls, stating how much she would like to have it. One of the forts sentries who was on duty overheard the bride and offered to go down and get it for her, as long as the groom would hold his rifle and take his post so the watch position was not abandoned, a crime of which there were very strict punishments in place for such a thing. After a few minutes the sentry did not return and the night grew cold. The bride decided to return to their chamber and the husband remained on the watch position, thinking the sentry had probably got talking to other guards an his way out of the fort. The groom waited eagerly for the sentry to return thinking he had perhaps used his break in guard duty to run a few personal errands. Not knowing how long the sentry would be the groom sat down and pulled his hat over his eyes and fell asleep. Charles fort's commander, the brides father, was conducting a routine inspection of the fort and came across the sleeping man. Due to his duty of following the strict military code of the day and wanting to set an example the commander drew his pistol and shot the sleeping man in the head. The shot knocked off the mans hat and realizing he had just killed his son in law, the commander was so distraught that he threw himself from the walls, dying instantly on impact. Hearing the shot from the pistol the bride ran to see what had happened, only to be the first one to discover her dead husband and father. Overcome with distress the bride to jumped from the ramparts to her death, dying next to her father on the ground below. 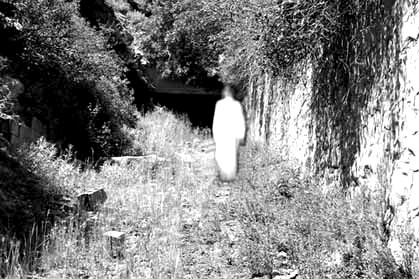 It is on the east side ramparts of the fort that her apparition has been seen standing silently staring at the walkway, a miserable spirit in a place of shattered happiness.